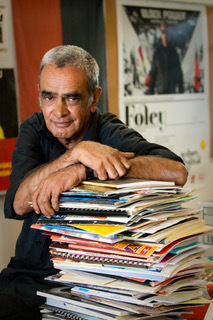 Professor Gary Foley, actor, dissident and esteemed academic historian, was a key member of the Aboriginal Black Power Movement and a critical figure in establishing the Aboriginal Embassy protest of 1972. He has been at the centre of major political activities in Australia for more than 45 years. In 2011 and 2012 he created and performed his one man show Foley with Ilbijerri Theatre, Jon Hawkes and Edwina Howell, for the Melbourne Arts Festival and the Sydney Festival. In 2015 he was the recipient of the Australia Council’s Red Ochre Award for a lifetime achievement in the Arts. Dr Edwina Howell has worked with Professor Foley since 2007. In this interview for NiTRO she draws out Professor Foley’s long connection with creative practice as a mechanism to bring public attention to the political challenges facing Aboriginal people in Australia. Edwina: You were involved in the first all Aboriginal Theatre company and the first Aboriginal TV show. Can you tell me a bit about your involvement in both? We filmed what was supposed to be a pilot for a series but the ABC found the political nature of our efforts to be a bit confronting and the television series never went beyond the pilot but it had such an impact that 45 years later it is probably the only piece of Australian television from that era which is still regularly replayed on mainstream television every year to this day. Gary: I was involved in the National Black Theatre which was the first all Aboriginal Theatre Company in Australia in the late 1960s, early 1970s mainly because of my friendship with Bob Maza who I met through Bruce McGuinness. Bob Maza moved from Melbourne to Sydney and set up what he called the National Black Theatre Company in a building across the road from the Aboriginal Legal Service which I had been working in at the time. And to cut a long story short Bob basically conned me into becoming a part of the show that they were rehearsing at the old Nimrod theatre in Kings Cross. That show was called Basically Black which had evolved from an earlier production by the Nindethana theatre company in Melbourne which had consisted of Bob Maza, Jack Charles and a white actor called Ollie Lewinski. Both of those theatre companies had evolved from Bob Maza’s interest in theatre which had been first stimulated when he traveled to Atlanta, Georgia in 1970 to attend an international Black Power conference along with Bruce McGuinness, Sol Bellear, West-Australian poet and playwright Jack Davis and Patsy Kruger. On their way back from that conference Bob had visited the National Black Theatre company of Harlem in New York and he realized the political potential of theatre as a means of getting a message across. The first stage production that we in the National Black Theatre (NBT) did was performed at the original Nimrod Theatre in Kings Cross between October and December 1972 and it was a very successful show in terms of audience numbers; it was a unique show for its time and it was a powerful political satirical review and very confronting for mainstream Australian theatre audiences in the early 70s. As a result of the success of that show we went on an ill-fated tour of North Queensland where we played at the Innisfail Festival of Arts and did a remarkable show on an Aboriginal reserve called Yarraabah but ultimately we went broke in Cairns. When we got back to Sydney the ABC expressed an interest in developing a series from the stage show Basically Black which led to the first all Aboriginal television show. Edwina: As a part of the National Black Theatre you held a philosophy of the potential of theatre to change peoples’ minds and to change the political direction and the direction of communities. Does the same philosophy drive your creative practice today now that you are working as an academic Professor? Gary: Prior to my involvement in the National Black Theatre I had realised the political potential of theatre when I had actually seen a performance of a show called Jack Charles is Up and Fighting that was performed at the Australian National University by the Nindethana Theatre with Bob Maza, Jack Charles and Ollie Lewinski. I was quite amazed by the power of that production. It was seeing that show that really amazed me and made me realise that was the political direction that I was going in at that time. We had set up our own Black Power group in Sydney and I saw the potential of theatre then so when Bob asked me, or conned me into joining the production of Basically Black, I wasn’t exactly an unwilling participant. I jumped at the chance. Some would argue that the lectures that I give at university about this era constitute a performance and they are probably not wrong. I still believe a little bit of creative license in the teaching of history goes a long way because it helps students maintain an interest in what is otherwise a fairly dry sort of area of study. So yes I think that the same philosophy or political strategy drives my creative practice today. In certain ways it could be argued that the Aboriginal Embassy itself was in no small part a theatrical performance. Because it had many of the features of a theatrical performance and because, as Chicka Dixon used to say, we’re sending these people up, we saw it as much as a satirical performance piece as anything else. Edwina: You say creative license, does that mean considerations of how you string a narrative of history together because some would suggest that creative license suggests telling untruths and others would see it as a necessary component of choosing facts and events from the world to relay history? Gary: Creative license in the sense of performing the part of certain actors in the history that I tell. It is not a divergence from the historical facts. It’s an attempt by me to bring to life certain moments. Probably the best known moment when I take up a character in my lectures is when talking about the arrival of the police at the Parliament lawns on the night of the 26th January 1972, where I think it helps to bring to life the ironic aspects of that moment because the Aboriginal activists who had gone and set up the protest on the lawns that night were fully expecting that the police would arrest them but to their surprise, the policeman who arrived did not arrest them. He in fact pointed out to them that they had actually found a loop hole in Canberra law whereby it was not illegal to camp on the lawns of Parliament House. So, as a teller of history, as a lecturer in history, as a recreator of history moments in the teaching of history I feel that that’s a good moment to bring to light, that particular moment and it works very well because it helps the students realise the absurdity of the situation. That a bunch of black activists from Redfern had accidentially discovered a loophole in the law which meant that they were able to create a camp in the lawns of Parliament house for the next six months, and in doing so end up changing the course of Australian history. I mean that’s the stuff that satirical dreams are made of. Edwina: I understand that the NBT had the political strategy of trying to inform people in the outside world about self-determination, but did the practice of creating theatre also serve a political purpose amongst yourselves? Do you believe that creating and performing theatre with others creates a sense of power and agency that in and of itself is political? Gary: The Black Theatre was very much the cultural wing of the Redfern Black Power collective, that’s the way we saw it. So the empowerment and agency was already there in the context of the broader political things that we were doing and so the theatre stuff I saw as an extension of the political activities that we were already involved in - the creation of Legal Services, Medical clinics, free breakfast for kids programs, women’s organisations, major demonstrations for land rights and in the long term the Aboriginal Embassy. In certain ways it could be argued that the Aboriginal Embassy itself was in no small part a theatrical performance. Because it had many of the features of a theatrical performance and because, as Chicka Dixon used to say, we’re sending these people up, we saw it as much as a satirical performance piece as anything else. What we were doing inside the Nimrod Theatre was merely a reflection of the many other things that we were doing outside the theatre, because all of the people that were involved in the theatre were involved in a range of other activities within the broader Sydney aboriginal community and the Black Power Movement. If you look at footage of the time of the early creation of the Aboriginal breakfast program you’ll see that Aileen Corpus who was the woman performer in Basically Black was very much involved in the organizing, creating and running of that program. Bindi Williams had come from a family that had had a long involvement in Sydney. His father Harry Williams’ band was the house band at the Foundation for Aboriginal Affairs run by Charlie Perkins in 1966-through to the late 1960s. His brother Bertie Williams was one of the four Aboriginal men who set up the Aboriginal Embassy on that night of 26th January 1972. And like I say Bob had had a long involvement in the Black Power movement both in Melbourne and ultimately in Sydney. And so the performers in the Theatre Company were very much caught up in the broader political thrust of that time. Edwina: Do you think performing helps give confidence and strength to a political voice outside of that performance space? Gary: Of course it did because you know it helped us take the message that we were trying to get across internally within the Redfern Aboriginal community but also on the streets with these major land rights demonstrations and our involvement in other political demonstrations such as the Springbok tour of the anti-apartheid actions and the broader anti-war demonstrations that we were involved in. It helped us take the message that we were trying to convey in those arenas into Sydney mainstream theatre audience which was to a certain extent an audience that we had not reached prior to that. a significant part of the history I was teaching . . . was ideally suited to the theatre because it contained a story that virtually nobody knew in mainstream Australian society and a story that needed to be known. It was fairly easy to adapt that into a theatrical performance. It is probably proof that much of what I had been doing before that in my lecturing was, to a certain extent, performance. Edwina: In 2011 and 2012 you created and performed your one-man theatre show, "Foley" at the Arts Centre in Melbourne and at the Sydney Opera House. What motivated you to take your personal story and that of the Aboriginal Black Power, Land Rights and Self-Determination Movement onto the stage? Gary: Again it was a quest to take the sort of stuff that I was teaching in university into a broader mainstream audience, a non-student audience. I was also in part motivated by seeing Jack Charles bring about a revival of his career, having shaken off his demons that had held him back and restricted his artistic output for 30 years. And given it was Jack Charles who in early 1972 I had seen in the Nindethana Theatre production, it was Jack who really was the one who inspired me to get involved in theatre in the first place in the sense of his remarkable performance in those days, and I’d always supported him in those thirty years through his troubles and I was so inspired to see him reemerge and show the world just how good he was and for him to be doing a one man show it planted the seed in my mind. I’d always thought anyway that a significant part of the history I was teaching both at Melbourne University and at Victoria University was ideally suited to the theatre because it contained a story that virtually nobody knew in mainstream Australian society and a story that needed to be known. It was fairly easy to adapt that into a theatrical performance. It is probably proof that much of what I had been doing before that in my lecturing was, to a certain extent, performance. So it pretty much felt like doing one of my lectures only a bit longer and with a little bit of music and lights and drama. Edwina: Do you believe theatre has the same potential to have a political impact on the younger generation today as a mode of political engagement, or do you think it has become a little bit redundant for that generation? Gary: I don’t think it has become redundant it’s just shifted platforms. Performance on Youtube or on the web is just as effective, or possibly more effective, than in the theatre because of the incredibly broader reach that you have on the internet. However, I’m just a little bit disappointed in some of the new comedy, theatrical material that is being produced. I think it’s not as hard hitting, it doesn’t have the same sort of political depth as the stuff that we did 45 years ago but I believe that there are people out there who are developing and who do have the potential to communicate some of the political ideas that we were on about. This new mode of communication has unbelievable potential because whatever message you’re saying goes far beyond a little theatre in Redfern or in Kingscross, it can be communicated instantly globally and that’s got to be a powerful thing. Edwina: You have recently contributed to two outstanding documentaries, Persons of Interest: Episode 3 Gary Foley, directed by Haydn Keenan, documenting the history of ASIO surveillance of Black Power activists in Australia, and The Redfern Story, directed by Darlene Johnson, on the development of the National Black Theatre. In the first your contribution was as co-creator and the second as a significant interview subject whose narrative provides much of the narrative flow for the documentary. Academics in creative arts fields are aware of the extra challenges faced when seeking to include creative Non-Traditional Research Outputs within academic research systems. As an academic located within a ‘traditional’ academic discipline, what drives you to spend the time and effort on creative work? Performance on . . .the web is just as effective, or possibly more effective, than in the theatre because of the incredibly broader reach that you have on the internet. However, I’m just a little bit disappointed in some of the new comedy, theatrical material that is being produced. I think it’s not as hard hitting, it doesn’t have the same sort of political depth as the stuff that we did 45 years ago but I believe that there are people out there who are developing and who do have the potential to communicate some of the political ideas that we were on about. Gary: The desire to see the sort of stuff that I teach in history at university reach a far broader audience because I believe that the stuff that I teach is an important area in Australian history that is almost completely unknown in the Australian community and it needs to be known you know. These are aspects of history that unless people have some sort of basic awareness, it is not really possible to analyse and make sense of political events that are happening around us today in Aboriginal affairs. We see this ignorance of the past constantly diverting the debate into ridiculous areas. If we are to have a meaningful debate about Australia today, the nature of racism in Australia today and the nature of the situation of Aboriginal people in Australia today then Australia needs to have a better understanding, because without that it’s the blind leading the blind. Edwina: Your archive includes extensive creative work that records the history of Aboriginal political life. What do you feel consideration of creative artefacts, such as the films held in your archive, could bring to the writing of political history? Gary: They are important primary source material for future historians. In that sense a great deal of material in my archive and a great deal of the material that I’m creating at the moment through either writing or performance or as an interview subject in documentaries is really creating primary source material for future historians to enable them to have a better grasp of what really occurred in the era and time that I was politically active. Edwina: You are currently working on a remake of Basically Black with Richard Bell for the 2019 Sydney Festival. How can you imagine the political impact of such a creative work can be measured? Gary: I think the measurement comes long after I’m dead. It remains to be seen, it could well be that it has absoliutely no impact whatsoever but on the other hand I would hope that future generations of historians or young Aboriginal researchers and activists would realise the importance of what is being done and said, but who knows. Professor Gary Foley’s archive is currently being built into Australia’s first and only online digital archive on the Australian Black Power, Land Rights and Self-determination Movement. For more information about the Aboriginal History Archive contact Professor Gary Foley on Gary.Foley@vu.edu.au or Dr Edwina Howell on Edwina.Howell@vu.edu.au. Dr Edwina Howell completed her PhD on the activist strategies of the Black Power Movement in 2013. Two of her most recent co-edited publications are The Aboriginal Tent Embassy: Sovereignty, Black Power, Land Rights and the State and the reference monograph by Barrie Dexter, Pandora’s Box: The Council for Aboriginal Affairs 1967-1976. She is currently Chief Investigator on the Aboriginal History Archive ARC LIEF and Research Fellow at Moondani Balluk, Victoria University.